When senior U.S. 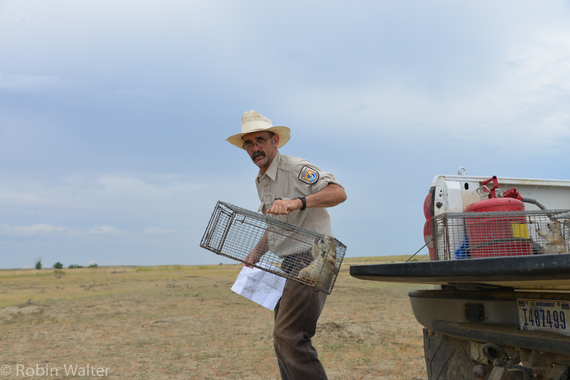 Fish and Wildlife Service biologist Randy Matchett invited me to visit Ferret Camp this past July during the Rediscover the Prairie expedition, I expected summer camp. Instead of campers, I found prairie dogs. Instead of log cabins, I saw dozens of little metal cages. Instead of a lice check, the field crew was checking for plague. The study underway at the UL Bend Wilderness Area in Northeastern Montana is part of a national effort to curb the occurrence of plague in prairie dog colonies and federally-endangered Black-footed ferret populations. The disease and loss of habitat have decimated both species. 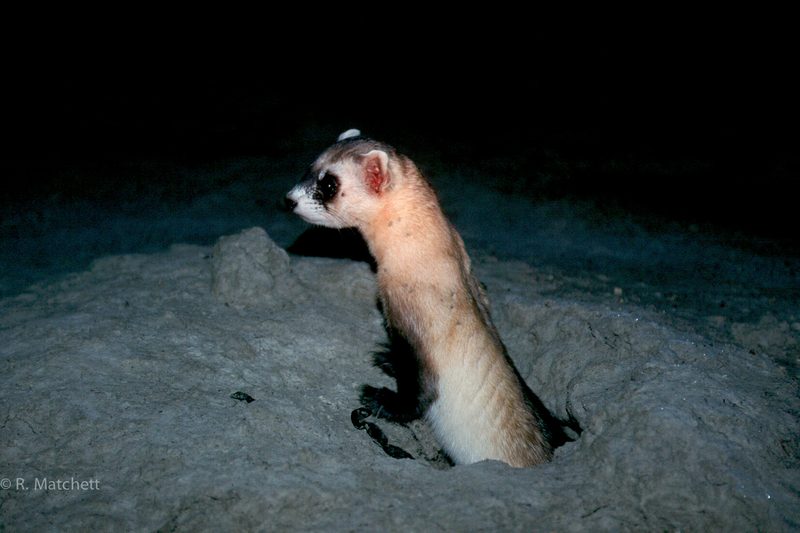 During the 20-year effort to reintroduce Black-footed ferrets to the region, the population has peaked and plummeted in a saw-tooth pattern. In the better years, their population has hovered around 90. Currently, six known ferrets inhabit UL Bend. 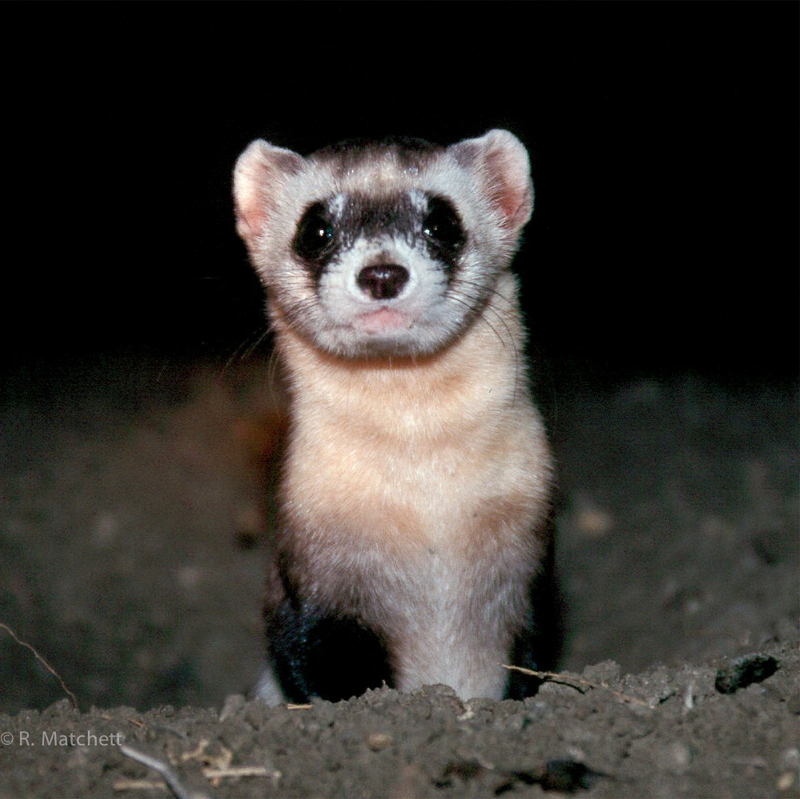 Black-footed ferrets are one of the rarest animals on the planet. Most of their activity occurs under the blanket of night. When they emerge from their dens, they push their heads out of the burrow like periscopes, swivel around, scan the horizon, then rear up and fling themselves back into the hole as they disappear from sight. Very few people know the animals exist, and even fewer have had the opportunity to see them in action. Randy Matchett is one of the lucky few. When he peers at you from under the shade of his white cowboy hat that has long since turned brown, you get the sense that he has logged his fair share of hours pounding the prairie. He appears to be as at home in this dusty, dry, and ruggedly beautiful landscape as the animals he has spent the last 20 years trying to save. 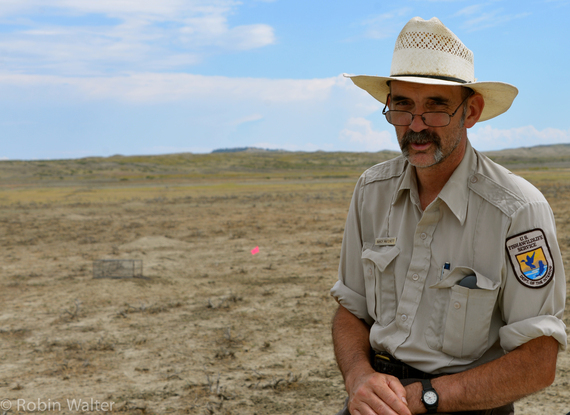 Matter-of-fact, Matchett will walk you through the history of Black-footed ferrets in a matter of minutes. He leads you through the disappointing years and the promising ones in the same even tone. "In September of 2013 UL Bend had a grand total of six ferrets. When we came back for a follow up survey, we could only find three. We had a whole missing litter of two kits and a mom. We couldn't find them anywhere. And so by October of 2013 we had a population of three," Matchett recalls. The male kits they found were small (520g and 550g) and the female kit was missing an eye. "We're not sure what we're going to have this summer or fall, the number may very well go to zero," he told me. As of October 2014, they found 5 females and 1 male. When European settlers pushed west at the turn of the century, they inaugurated a massive transformation of the Great Plains landscape. Since their arrival, Black-footed ferrets have held a tenuous place in the plains. Settlers plowed under enormous swaths of native prairie for agricultural purposes. 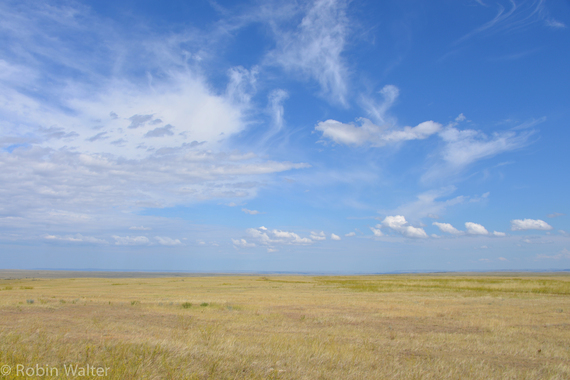 Prairie dog habitat virtually disappeared. As prairie dogs began to suffer, so did the ferrets. Black-footed ferrets evolved as a specialist species; they depend entirely upon prairie dogs both for their food source and their habitat. In Pre-Colombian times, millions of acres of contiguous prairie dog habitat stretched across the plains. They now occupy a miniscule two percent of their historical range. Seen as a competitor for grass and a pest by many, poisoning and aggressive shooting campaigns have decimated prairie dog numbers. As prairie dogs grow scarcer across the prairie, so do Black-footed ferrets. With the arrival of plague on the landscape, the disease that has ravaged human populations from ancient China to Medieval Europe, chances for the species' survival are shrinking. When plague infects an area, entire prairie dog colonies collapse and Black-footed ferrets lose their habitat and prey base in one broad stroke. 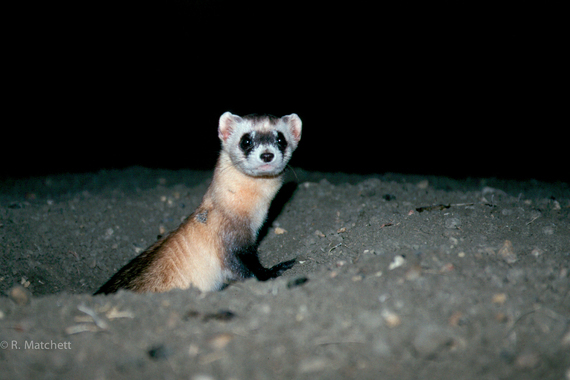 Black-footed ferrets have a long history of disappearance and reappearance. Thought to be extinct by the late '50s, a small population was found in South Dakota in 1964. As their numbers began to decrease in the wild, scientists began a captive breeding program. Ultimately unsuccessful, the last ferret died in captivity in 1974. Because the wild population died out as well, the Black-footed ferret was once again declared extinct. That is, until 1981, when a ranch dog near Meeteetsee, Wyoming dragged a dead ferret home to its owners. The owners sent it to a local taxidermist who identified it as a Black-footed ferret. The taxidermist notified wildlife authorities, surveys ensued, and a small population was discovered. The species, thought by all to have been extinct for half a decade, was back. 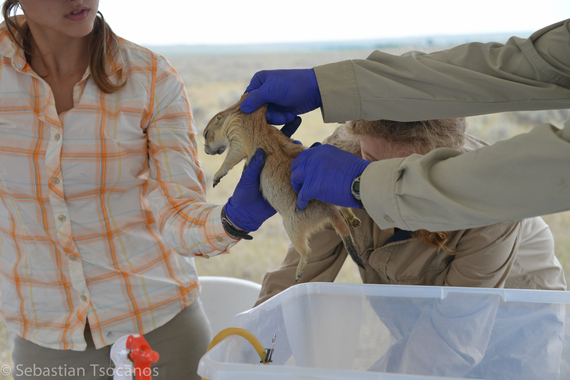 When I arrived at UL Bend, a wilderness area tucked into the Missouri breaks, a handful of volunteers and biologists shouted back and forth as they juggled anesthetized prairie dogs beneath a blue pop up tent in the middle of the prairie. Eighty-five prairie dogs scurried back and forth in their cages as they nervously waited for their turn through the gauntlet. 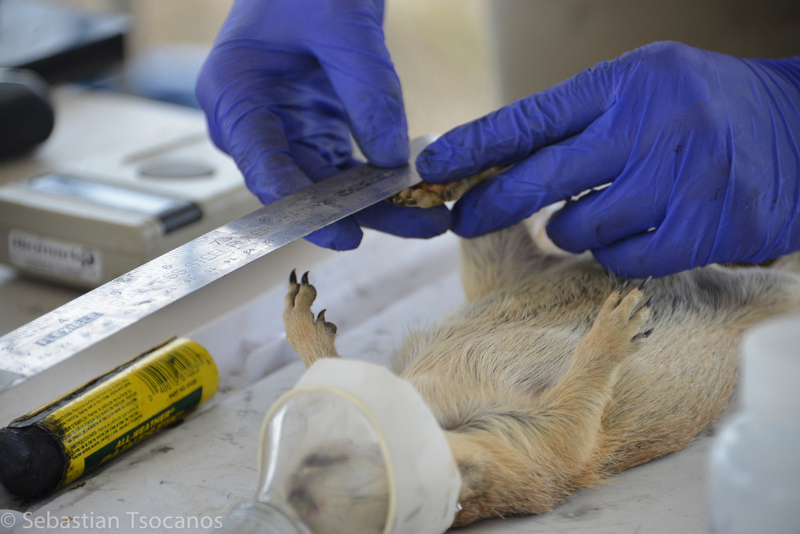 With military precision, a technician caught a prairie dog and funneled it into a plastic tube to be anesthetized. Once it was good and knocked out, the next tech in line placed the animal on a set of scales, ran a comb over its back, and sealed a tuft of its fur in a manila pouch. They shuffled the prairie dog down the line, drew its blood, and measured its foot length. Shrill squeaks punctured the stream of data shouted to the tech responsible for getting everything down on paper. "8418, right ear missing. Yes, fleas! Yes, vaccine!" The purpose of the study is to assess whether or not a new vaccine against plague, developed in a lab, works in the wild. "The end goal is to overcome the fatal flaw in recovery efforts. If we can overcome the plague, we can stabilize prairie dog populations and eventually support ferrets," Mathew McCollister of USFWS explained. The plague arrived at UL Bend in the '90s. Some estimates claim it has wiped out 80 percent of all ferret habitat. "You put 20 years of work into a ferret population, and then you lose the prey base, and it all falls apart," says McCollister. Last year the ferret world saw record production in captivity, but five reintroduction sites had to cancel because plague had wiped out all viable habitat. Biologists could not reintroduce the ferrets because there was nowhere for them to go. Over the last several years the disease has spread nationally. After the technicians drew the last bead of blood, we climbed into Matchett's white pickup. 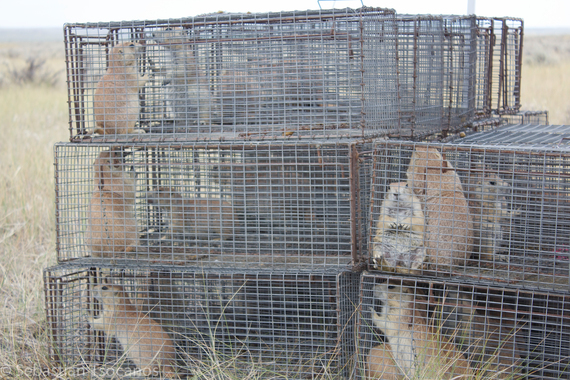 The truck bed was full of prairie dogs clawing mesh cages. 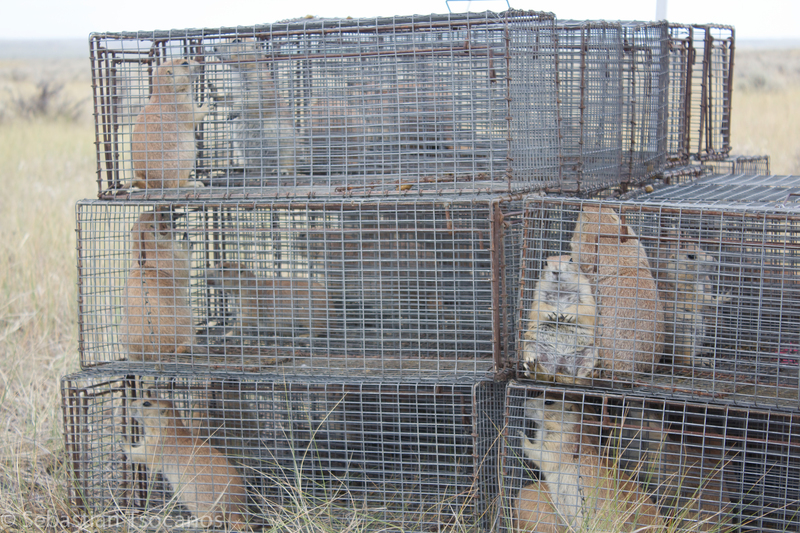 The cages slid from one side of the truck to the other as we made our way down a bumpy two track adjacent to the prairie dog town where the animals had been captured at daybreak. Coal black eyes peered out at us as we lowered the cages from the bed of the truck. We made our way through the maze of the prairie dog town and carried the prairie dogs to their burrows. We tipped the cages over and watched them dive head first into their holes. We watched the last prairie dog kick up a cloud of dust as it disappeared. As we made our way back to the tent, I asked Matchett if the uphill battle wears on him. "It's tough and frustrating for sure, but we keep trying," he said. "I'm getting to the point in my career where kids like this," he pointed to the seven or so volunteers packing up the last of the equipment, "are the ones who are going to figure it out and solve it." According to Matchett, the two largest factors that affect ferret recovery are plague and basic human intolerance of prairie dogs. The good news for ferrets is that scientists have developed an effective vaccine against plague. The trick is to figure out how to apply it on a management level. As McCollister points out, "it is all a matter of how many people are invested in it, how much funding you can get to do it, and if you can apply it precisely." The second factor is a social one. It largely relates to agricultural competition. McCollister notes that "the bottom line is that prairie dogs eat grass, and that can be a problem for some people." It is a problem for many, but not for all. According to some, cattle actually prefer to graze on areas cropped down by prairie dogs during certain times of the year. Plus, it's worth it to them to keep prairie dogs around because they enjoy the wildlife prairie dogs help support. Mountain plovers, for example, depend on short-grass for their nesting habitat. You can often see Ferruginous hawks hunting above prairie dog towns at dusk. 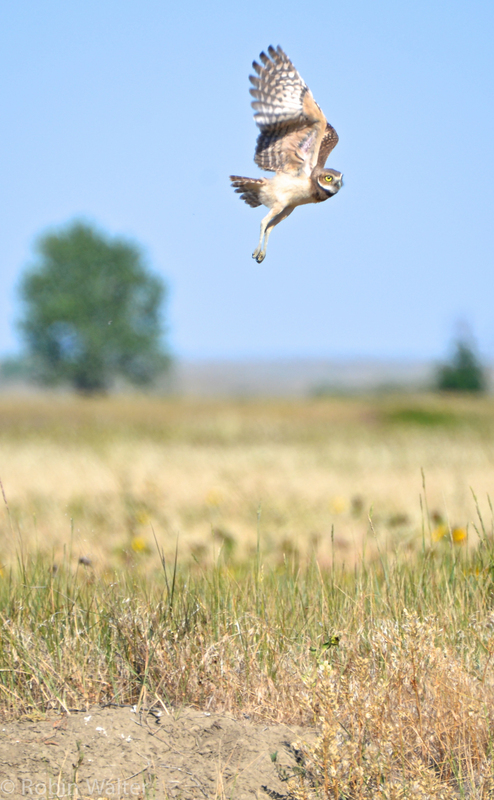 Burrowing owls use prairie dog burrows for shelter and nesting habitat. Several promising programs are on the horizon for prairie dogs and the ferrets that depend on them. The Nature Conservancy's Matador Ranch, for example, operates a "Grass Bank" that offers a break on grazing leases if participating ranchers implement conservation measures on their own property. One of those measures is to maintain prairie dog habitat. The Natural Resources Conservation Service has begun a landowner incentive program for private landowners. 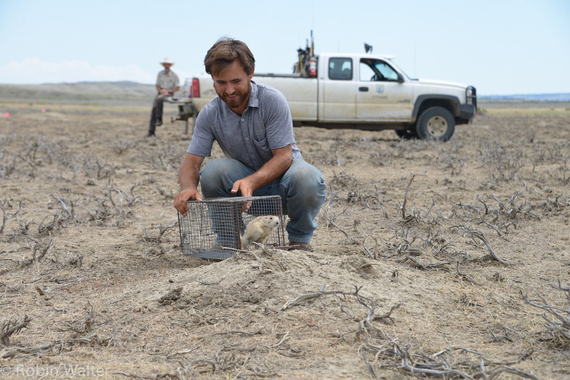 The program pays landowners a rental fee for tolerating prairie dogs. The Fort Belknap Indian reservation released 21 new ferrets onto tribal land last September. In order to de-list ferrets from the Endangered Species Act, 3,000 breeding adults must span across nine states. Roughly 300-500 ferrets currently live in the wild. Among those are the six ferrets living in UL Bend, unless luck has turned against them. No one said that saving a species from the brink of extinction would be easy, cheap, or quick. There have been set backs, and we'll probably see more, but that's to be expected. To many, it may seem like twenty years is a long time to spend and still not have a stable ferret population, but in the grand scheme of things, twenty years is the blink of an eye. Over the past century, endangered flora and fauna of the Great Plains have included at least seven different mammals, thirteen birds, six fish, one amphibian, one insect, and eleven vascular plants. Whether or not the Black-footed ferret will stay among their ranks or head towards the cliff of extinction remains to be seen. Chances are the next time we declare the species extinct, it won't be a vanishing act --- Black-footed ferrets will truly be gone from the landscape. Since their dispersal from Siberia across the Bering Land Bridge, Black-footed ferrets have roamed on the continent for approximately 100,000 years. Whether or not they'll be around to see the next 100,000 is up in the air. This blog is part of an ongoing series following the Rediscover the Prairie expedition, a horseback journey across the Great Plains. To learn more please visit www.rediscovertheprairie.org and follow the project on Facebook.